Jason is a Circus, Cabaret and Variety performer and has been working in the New York City Nightlife scene since 2009 as a regular performer at venues like Galapagos Art Space, The Slipper Room, The Bridges and Coney Island, among others. He performs mainly as an aerialist, he also does partner acrobatics with Eric Gorsuch better known as Mr Gorgeous. His passion for circus began in 2007 after he became a Flying Trapeze Instructor at Trapeze School New York where he brought a fun, yet intense approach to teaching, perfecting skills and adapting the techniques he has learned from his own experiences training in Sports Acrobatics since the age of 8. Jason is a part of Aerial Arts NYC, a circus school based in Manhattan where he teaches aerial classes, specifically Corde Lisse, Hammock and Static Trapeze. 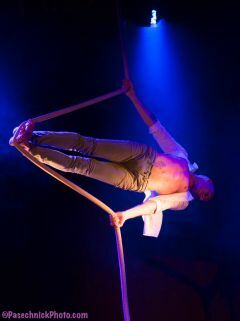 He has also joined the Circus Warehouse team as their Aerial Rope instructor. In the Fall of 2012 Jason joined forces with Burlesque and Aerial sensation Harvest Moon, they perform a Double Trapeze routine and go by the name of AeroTrapeze. Their act was described as “a must-see!” by BurlesqueBeat.com after their performance in The New York Burlesque Festival in 2013 and received great reviews at the Burlesque Hall of Fame, Las Vegas in 2015. Jason has also produced shows like “The Waterfront Follies”, “Bawdville!”, “DELIRIO” and is co-producer of “Boys Night: An All-Male Cirquelesque Revue” where they’ve headlined for Atlantis Cruises and have a monthly residency at The Slipper Room NYC. He has also performed at the legendary Moisture Festival in Seattle, WA, The Burlesque Hall of Fame in Las Vegas, NV and Atlantis Cruises to name a few.